Fanvil, an award winning VoIP desktop phone developer and manufacturer, has updated the firmware on its 4th generation X5S and X6 IP phones. This means that users of the Fanvil X5S can upgrade to 16 SIP lines and users of the Fanvil X6 can upgrade to 20 SIP lines. Upgrade to from 6 – 16 SIP lines on the Fanvil X5S IP phone with the latest firmware. 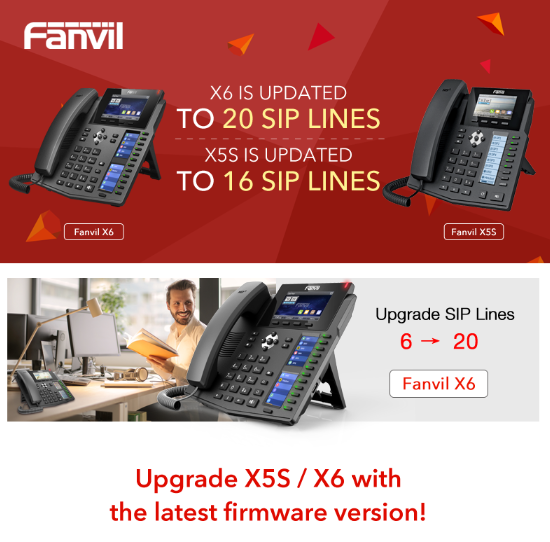 Upgrade to from 6 – 20 SIP lines on the Fanvil X6 IP phone with the latest firmware.